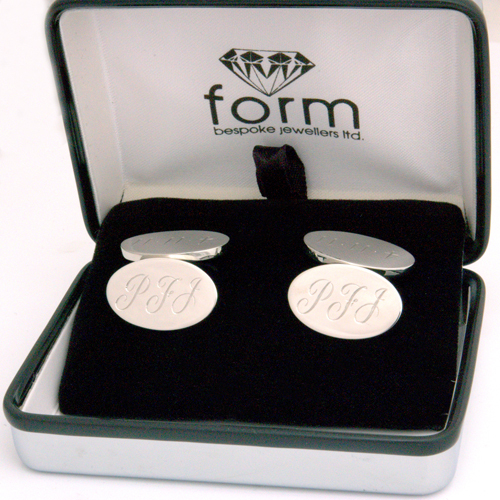 Platinum Engraved Cufflinks — Form Bespoke Jewellers Ltd. The perfect surprise for the groom on his big day – platinum engraved cufflinks. This customer asked us to create their engagement ring and wedding rings but as an extra special surprise the bride-to-be contacted us separately and asked us to create some bespoke cufflinks to mark the big day! We sourced the platinum oval plates and attached platinum chains to link the two halves. The cufflinks were then hand engraved by our amazingly talented engraver and hand finished by the team at the Chapel Allerton. Little did she know but the groom had also been in touch and asked us to create her a surprise diamond pendant and earrings to match her engagement ring!